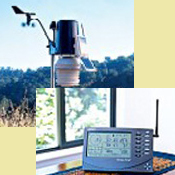 The Pepperridge Weather Station has been in continious operation in the Phoenix Metro Area since 1997. The station was first located in Chandler,Az near the intersection of, Arizona Ave. and Chandler Blvd. The station operated at this location from Jul 1997 to Jul 1998. The station moved to it present location in Aug, 1998. It has operated in North Phoenix near the intersection of, Cave Creek Rds and Union Hills Dr, since Aug, 1998. The Pepperridge weather station is now powered by the Davis Vantage Pro 2 Plus with FARS (Fan-Aspirated Radiation Shield). The VP2 Pro Plus station ,(pictured right), collects; temperature, humidity, dewpoint, barometer, rainfall, rainfall rate, Solar Raditation, U.V. Index and windspeed and direction with 10 min averages . 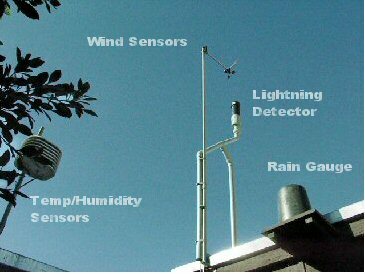 This weather station replaces our Davis Weather Monitor II weather station which now serves as a back-up ,(pictured below left). 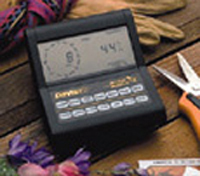 This weather station collects and analyzes the data through the use of a software program named, Weatherlink5.7. The weatherlink software collects and stores data from the Vantage Pro2 Plus with FARS writes files to the data base. This software also uploads the data to this internet site 24 hrs a day, occasionally the station will be offline while the computer server is rebooted. This will most likely occur in the early morning hours between 2am and 6am local time. This station has proven to be fairly reliable and accurate. The temp/Humidity Sensor is housed in a solar radiation shield with Fan-Aspritation to prevent errant temperature readings from accidental direct solar exposure and reflective heat. The automatic raingauge is located directly above the radiation shield as part of the ISS (Integrated sensor suite). The UV and Solar radiation sensors are mounted on a shelf next to the rain collector on the outside of the (ISS). There were some problems with the original Weather Montior II console unit not operating correctly at low humidity below 10% ,especially when the temp/Humidity Sensor was replaced with the newer improved model. But since the replacement of the console unit, approximately 3 years ago with the newer improved model, lower humidity levels are being recorded more accurately. The Anemometer is mounted on a pole 10ft above the roofline or about 20ft off the ground,(pictured left). There are no immediate major obstructions to block wind speed or direction readings. The exception is a couple of palm trees to southwest that may cause a minor obstruction that may slightly block wind speed readings, when southwest winds occur, so the wind readings appear to be fairly accurate. Davis rates the anemometer at +/- 5% for wind speed and the wind direction at +/- 7�. The automated rain gauge, (pictured above), is fairly accurate and it is backup by a weather bureau standard issued rain gauge. However sometimes minor adjustments are necessary to bring the two gauges into agreement with one another. The barometer is periodically adjusted,(approximately once a month),with the reading at Sky Harbor Airport. The real time lightning detection system is here just in time to track the monsoon season thunderstorms. The lightning detection system consists of a Boltek lightning detector system with the dectector's antenna mounted to the anemometer mast at height of 17 ft, (pictured above). The lightning analysis is performed by Lightning 2000 from Aninoquisi Software. The webmaster has recently received storm spotter training from N.O.A.A. Phoenix office and now is officially a member of the Sky Warn storm spotters program. This means that severe weather events observed at this station will be directly be reported to the Phoenix Weather Service Office. The Sky Warn Program helps the NWS verify where severe weather events are occuring and helps validate the weather warnings they issue. � 2005- 2007 Pepper Ridge North Valley Weather All rights reserved.